Last Chance to Save $50 on MACNA 2018 Full Conference Passes! Your last chance to get MACNA 2018 Full Conference Passes at $50 off ends on February 28th! The early bird $139 deal is the best way to experience all that MACNA 2018 has to offer. Book now to still get $50 off! A huge exhibit hall, speakers, workshops, our Friday night reception, and our Saturday night banquet. You get it all! Kids 17 and under are admitted free, 14 and under must be accompanied by an adult. Also check out our newly updated Floor Plan (macna.org/floor) and meet our great MACNA Speakers (macna.org/talks)! Price goes to $159 on March 1st. Our best MACNA hotel rate in years! Just $114 with free parking! I have tickets bought and room booked!!! Who else is going?!? Don't miss out on this awesome event. Feeling lucky in Vegas, a Utah couple won the grand prize trip to Fiji (3 years ago) with Walt Smith you may be next. We also have our tickets and room booked. Can't wait! Tickets bought and accomodations booked. Seams crazy that our members may not take advantage of this show. It's even closer than the Denver show and won't be back out west for a couple of years. So if you have considered going to a MACNA this one will be one of the least expensive ones for our WMAS members to attend. Get your plans made and make it happen! Anyone want to split a 2 bedroom suite at the top with me? 2 separate bedrooms with a living room, dining room area. About $700 a night with taxes, etc. It's too close to miss. Have a meet-up with your friends / club at MACNA 2018! We want our MACNA attendees to have the best experience possible, and to do that we are offering our meeting space so that you can meet-up with your friends! Are you a member of your local club and want to have a meeting at MACNA? Keep temperate water anemones, and want to meet others that do the same? 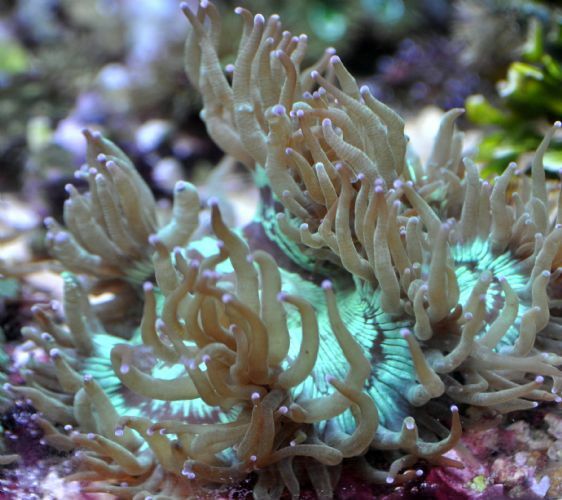 A fan of NPS coral and want to discuss feeding tips with other hobbyists and professionals? Want to finally put a face to that online screen name you've been corresponding with for 5 years? Get your group together and let MACNA know that you are interested in having a dedicated meet-up at MACNA 2018. We'll put your meet-up on the schedule, so that you can make all sorts of new fishy friends! Pre-MACNA2018 Hotel rates from only $49 a night! Come early and make it a vacation! I seen that on a confirmation email they sent me a couple of days ago, Awesone! MACNA 2018 Speakers - 30 Speakers for 30 Years! Part 1: Martin Moe, Dr. Margaret Miller, Ben Johnson, Joe Caparatta, and Terry Siegel. 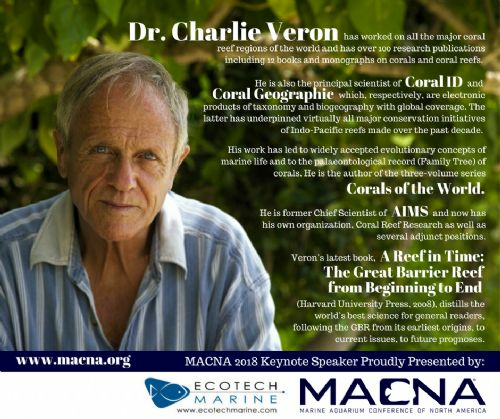 MACNA is proud to announce our #MACNA2018 Keynote Speaker! Dr. Charlie Veron. This one is too EPIC and ... too close to home to miss. Only those attending the Saturday Night Banquet (Full Conference Pass Holders) get to witness the Keynote Presentation. See all you Utah Reefers in September! Who is all going from WMAS? We are going. Staying on Freemont street at The Golden Nugget. Dave and I will be there. First time attending MACNA and first time actually exploring Vegas. What can I expect from MACNA? Can you purchase stuff at this event or is it just a trade show of upcoming products? Also, any suggestions on where to go explore in Vegas would be appreciated. Have fun, it's a blast! It's fun to plan things but we always found we were at MACNA way longer then we expected. Neptune is doing a presentation Friday morning, see if you can register for that if you have one or want one. Go to the Friday night party and the banquet. Don't be afraid to ask for samples. Talk to everyone! Vendors, attendees and speakers. You never know what you can learn. Go to the speakers sessions. You have years of amazing experience all there for the taking. You can buy fish and coral and bring back with some planning. You can ask the vendors to hold your stuff until Sunday. 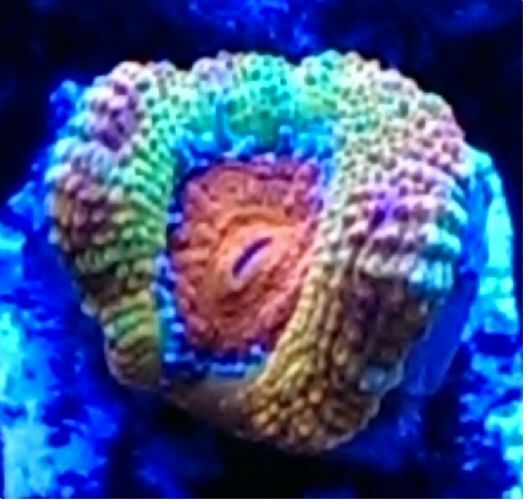 Just take a pic of the coral and the vendor. Chad. IÃ¢â‚¬â„¢ll be there. LetÃ¢â‚¬â„¢s meet up and I will take you to some high limit baccarat games.